Do you have brick walls to scale? The JGSLA can help! Join us for an afternoon of mentor-guided research using the microfilms, books and records at the Library, and enjoy free access to Ancestry.com & Footnote.com. Knowledgable members will guide you at the computers and in the microfilm room. 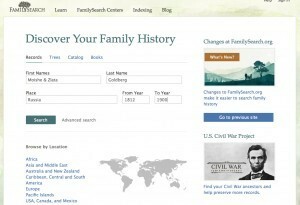 Get started using the abundant resources of the LDS Library and learn techniques for maximizing your searches using the free FamilySearch.org database, Ancestry and JewishGen. he LAFHL has one of the largest holdings of any branch in the LDS Family History Library System, including 86 networked computers and 56,000 rolls of film, including extensive Polish, Hungarian, Austrian and German Jewish vital record microfilms. Bring your research notes, family trees, copies of documents and written questions with you so we can serve you better. The following classes will be offered. Two seating choices for Todd Knowles lectures! Speaker: W. Todd Knowles is a member of the staff of the Family History Library in Salt Lake City, Utah. He is an accredited genealogist specializing in English and Jewish research. From the age of 13, when he first began researching his own family, Todd has been drawn to find out everything he could about his great-great grandfather, Morris David Rosenbaum, a Polish Jew. His grandfather’s journey took him from Poland to the United States with a stopover in England. It is in trying to find more about his life that Todd began compling recors of the Jews of the British Isles. That collection, now known as the Knowles Collection is available through www.FamilySearch.org. Originally release in September 2007, with records of 65,5000 people, it has now grown to include records of over 195,000 individuals from more than 30 differne countries. Stories of some families can be followed at: www.knowlescollection.blogspot.com. Speaker: Madeleine Isenberg is a retired computer programmer and technical writer. Having lived in Israel for 10 years, she’s fluent in Hebrew, but also reads German and French. She’s been researching her family in Slovakia, Austro-Hungary, and Poland and has been a member of JGSLA for 20 years. A self-styled “stelaeglyphologist,” in the past 7 years, she deciphered and translated over 3000 tombstones from more than 20 cemeteries, and collected and maintained vital statistics for Jews who once lived in Spis Region of Slovakia. With Mikulas Liptak, of Slovakia, she co-authored, “Jews in the Spis Region, Vol. I, Kezmarok and its Surroundings,” She created the Shtetlinks website for Kezmark;has contributed burial information for JOWBR. This event is for JGSLA members only. No guests are permitted, but you can join or renew at the door. Bring your lunch, drinks or snacks to eat in their lunchroom. There are also vending machines and a microwave.